Arsenal have had to abandon plans to sell off 38,500 seats from Highbury to fans because small traces of toxic metal cadmium have been found in them. The seats were to be sold, priced £19.99, to allow fans a souvenir before the move to the Emirates Stadium. "The fact that there is a very small risk is enough reason to stop us from releasing them," said managing director Keith Edelman. "It's very frustrating. I apologise for any inconvenience this has caused." All fans who placed an order will be reimbursed and the club has pledged it will make a donation on behalf of all purchasers to the David Rocastle Trust. Other memorabilia will be available at an auction on 29 July, and fans can still buy a one square foot patch of the Highbury pitch for £25. A statement on the club website explained what the problem was. "We have been informed that all of the Highbury seats, apart from the directors' box, the dug outs and the executive box seats, contain very small amounts of the toxic metal cadmium," it said. "The seats are completely safe and are not a risk to health when located within a stadium. "But it is understood that if the seats are stored inside and used regularly over a long period of time, there is a slight risk that very small amounts of cadmium could be released. "The club is not prepared to put any of our supporters in this situation. 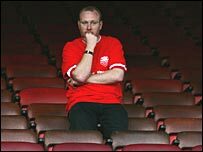 "Having also received a directive from the European Commission, unfortunately we cannot sell any Highbury seats for individual domestic use."